This Roller Derby is the ideal sporting gear for roller-skating and blading funs. It is designed to enable you to enjoy your outdoor as well as indoor skating and blading activities. It is uniquely designed with a soft boot support system, a triple cam lever buckle and adjustment systems. Besides these amazing features, the Roller Derby Women’s V-Tech 500 has a polymer reinforced frame and boots with an adjustable skate sizing, making it the ideas skate wear for the growing feet. This is a sports gear. It is well reinforced with polymer frames giving it the desired durability. Its 76mm urethane speed capabilities make your skating adventures fun, not forgetting its adjustable sizing, which makes it ideal for the growing foot. The triple cam-lever buckle is an added feature in this roller. It ensures an easy on an off, while the padding keeps your feet safe. Making it the preferred roller wear for girls. Despite the ideal design, the roller is limiting in-terms of size. It only accommodates shoe sizes 6-9. It cannot perfectly accommodate those below or above the prescribed shoe size. It is made of a rather cheap padding material that wears out with time, making it uncomfortable to wear. In terms of customer reviews, the Roller Derby Women’s V-Tech 500 Button Adjustable Inline Skate scores fairly well. It has a 4.3 customer rating out of the possible five. Some customers have reviewed it has the best roller for their daughters. With the shoe being comfortable, easily adjustable and easy to put on and off. 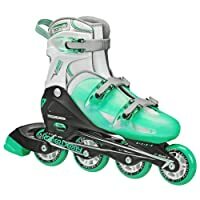 The Bladerunner by Rollerblade Advantage Pro XT Women’s Adult Fitness Inline Skate gives the perfect skating experience for beginners and the lovers of value driven skating. It boosts of amazing features such as a supporting skating shell for learning, an amazing padding in the shoe’s liner and tongue, a uniquely customized frame and a blade runner of 80mm wheels, fitted with ABEC 7 bearings. The supportive and comfortable nature of this Inline Skate makes it the ideal wear for beginner skaters. It is an easy to wear the shoe, giving the user a smooth ride all the way. Learners find it easy to use these skaters because of their supportive shell. It provides the support and balances the beginner needs. The frame creates a lowered center for gravity, with its unique integration with the shell, giving the skater a good skating balance. The ABEC 7 bearings enable moderate skating speed with less effort. The Bladerunner by Rollerblade Advantage Pro XT Women’s Adult Fitness Inline Skate has been made to support beginners and intermediate skaters. They provide the support and balance with user’s minimal effort. This is an easy ride for the beginner and at times, the beginner may not grasp the needed skills, with such an easy to ride in skater shoe. With time, the ABEC 7 bearings wear out, making it difficult to get the smooth ride. The Bladerunner by Rollerblade Advantage Pro XT Women’s Adult Fitness Inline Skate has a good market reputation. Consumers who have rated it at five stars say that it is comfortable, smooth to ride in and durable. The colors to choose from are also amazing. The size specifications are a disappointment however, to some customers. Are you a beginning skater on a budget, then this is the perfect wear. 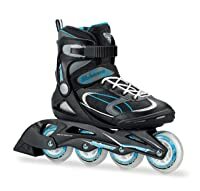 The Rollerblade Zetrablade Men’s Adult Fitness Performance Inline Skates is a perfect entry-level skate for a craving beginner, with a supportive experience. It has a high cuff, a comfortable liner and a durable monocoque customized frame. 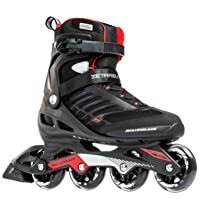 The Rollerblade Zetrablade Men’s Adult Fitness Inline Skate is a budget skate, ideal for those beginners on a budget, and would not want to spend much on skates. The supportive nature of the wear is an added advantage, despite the low budget. The liner padding gives the skater a comfortable experience, with the closure system of the shoe making the beginner feel like an expert skater. The shoe has the best wheels for speed, smooth ride and balance. The SG5 bearings are for this purpose. Due to its low budget, the Rollerblade Zetrablade Men’s Adult Fitness Inline Skate has been found not very durable. They are best for beginners, thus limiting expert users who would wish to purchase a pair due to the low budget of the shoes. The Rollerblade Zetrablade Men’s Adult Fitness Inline Skate scores fairly in the market, with a 4.5 overall score. With some rating is based on their entry-level good experience, low budget and the comfortable feeling they get while using it.